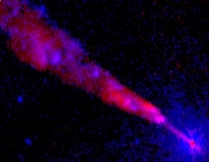 Relativistic ejecta (jets) from the center of radio galaxies are narrow, collimated streams of particles and energy extending from the inner parts of the optical galaxy to beyond its outskirts, at distances of millions of light years. Just like fireworks on the 4th of July, they shine at many colors across the electromagnetic spectrum, from radio to optical to X-ray wavelengths. Unlike in the case of fireworks, however, we still do not know what produces these long, fast, and multicolor structures. A billion solar mass, rapidly spinning black hole, a magnetic field, and an accretion disk seem to be essential ingredients for jet formation, but their relative importance still needs to be elucidated and quantified. In this talk, I will review our current understanding of jet physics, focusing especially on recent observations with NASA’s Chandra X-ray observatory and the Hubble Space Telescope. The superb angular resolution and sensitivity of these telescopes, coupled with ground-based radio observations, are providing ground-breaking clues on these enigmatic, yet fascinating, structures. 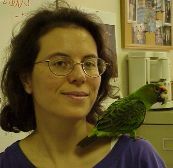 RITA M. SAMBRUNA has a PhD in Astrophysics from the International School of Advanced Studies in Trieste, Italy. From 2000 to 2005, she was member of the Faculty in the Department of Physics and Astronomy at George Mason University, and the Clare Boothe Luce Professor of Astrophysics. Currently, Dr. Sambruna is a senior Astrophysicist at NASA’s Goddard Space Flight Center in Greenbelt, MD, where she continues her research on active galactic nuclei and contributes to the upcoming Gamma Ray Large Area Space Telescope (GLAST) mission. To be launched in September 2007, GLAST will provide a sensitive survey of the sky at gamma-rays, unraveling current mysteries and discovering new ones. Rita lives in Clifton VA with her husband, five parrots, and two horses. President William Saalbach called the 2,204th meeting to order at 8:19 pm March 24, 2006. The minutes of the 2,203rd meeting were read and approved. Mr. Saalbach then introduced the speaker of the evening, Ms. Rita M. Sambruna of George Mason University and Goddard Space Flight Center. Ms. Sambruna spoke on Long, Fast, and Multicolored Fireworks from the Centers of Galaxies. Ms. Sambruna began by showing some pictures of the jets she spoke of. They look quite different from different angles. To illustrate this, she showed pictures of one of her horses from different angles, and sure enough, the pictures did look quite different. The galaxies look like diffuse, glowing doughnuts and the jets shoot out in a well collimated stream from the centers of the doughnut hole, diffusing gradually as they travel. She calls the sources of these jets AGNs, for active galactic nuclei. The jets reach, usually, beyond the optical halos of the galaxies. They originate, she said, at the bright point centers of otherwise normal galaxies. The jets are powered by accretion of galaxy gas onto a supermassive black hole. Gas comes down from the rim, energy accumulates in the center and blows it out perpendicular to the disk. Occasionally there are blobs or bulb-like formations along the jets, as though they hit something that deformed them. The blobs occur far from the galaxies and are much larger, perhaps 100 times the size, of the galaxies themselves. Some of the open questions about the jets are: How are they formed? How do they stay collimated? What are they made of? How is the energy transported? Why are they present in only some of the AGN galaxies? In general, what are their physical properties? She mentioned a phenomenon called superliminal motion. That is, the blobs appear to move at several times the speed of light. This, it seems, is an illusion. It appears when the angle of travel relative to the observer is small. What actually happens is that the origins of the blobs are at a different time than it appears. She described “blazars,” which are radio-loud AGNs at favorable angles to earth. She said the jets are not in a vacuum, they are surrounded by “stuff,” and stuff sometimes goes in the jets. She described the Chandra Observatory, launched in 1999. It does broad-band spectroscopy and provides unprecedented angular resolution. She was very pleased with the first picture from Chandra of a jet. “What a jet!” she exclaimed. The picture did look nice, as it represented the jet in bright colors. This jet was about 500 kiloparsecs long (a kiloparsec being about 3,258 light-years). One of the things they learned with Chandra is that some of the jets have a lot of power in X-rays. The X-rays decrease in power along the jet, and she speculated that that may be caused by impact with external gas. Radio, however, increases along the jet. She believes that, with Chandra, we are just beginning to tap into the physics of relativistic jets. She says the origin of the powerful X-ray emission is still under debate. Are blazars and quasars the same thing, someone asked. Yes and no, she said. The difference is orientation. Another person asked if the jets are still forming now. She did not know. Some of what she told us seemed to imply, a third person said, that black holes have an elaborate structure. He speculated about spin in black holes and asked a question about their internal structure or if the phenomena associated with them are due to surface characteristics. Ms. Sambruna said the only implication she took from her observations is that they spin. If the question is, what is under the surface, she said, there is no way to tell what is there. Someone asked if the jets have enough power to explain the expansion of the universe. She did not take a position. Others opined not, that they are different phenomena on a different scale. Do the jets always come out from both sides of the galaxy? Usually. We don't know for sure, because sometimes only one of them is visible because of the orientation. The black holes are always at the center, so it is clear that they have something to do with the structure. How does the history of the jet relate to the black hole? She guesses the jets are related to how the holes are created. She has never seen a black hole created, but is hoping to. “Talks like that don't just happen,” Mr. Saalbach said. He encouraged all to join the Society and to donate. He invited all present to take with them announcements of the 2,205th meeting and to take and share brochures about the Society. He almost forgot the parking announcement, but he did make it. Finally, at 9:53 pm, he adjourned the 2,204th meeting to the social hour.